This knife is one of two knives used in the attack, large enough to cause the fatal gaping wound on the left of Meredith's neck. From measuring the width and depth of the other wounds, the second knife has a blade 9cm long and 4cm wide. It was never found. High resolution picture of the blade of "double DNA knife" taken in March 2011, in Conti and Vecchiotti's lab. At the trial of Amanda Knox and Raffaele Sollecito, Exhibit 36 was a 31 cm (12.2 inch) long knife with a 17.2 cm (6.8 inch) blade and a dark molded plastic handle. It was seized from the kitchen cutlery drawer at Raffaele Sollecito's home, located at 110 Corso Garibaldi in Perugia, on 6 November, 2007 when Chief Inspector Armando Finzi was ordered to perform a search of Sollecito's residence. On entering the apartment he and his associate, inspector Volturno, were struck by 'the strong smell of bleach'. The knife appeared 'unnaturally clean' and had scratches along its length. This exhibit is important because “Sample 36b” taken from a scratch on the knife blade yielded Meredith Kercher's biological profile. It also has Amanda Knox's DNA profile on the blade where it meets the handle, which is why it is known as the "Double DNA Knife"
Another human trace (36-I) was found on this blade in 2011 by the independent reviewers appointed by the Hellmann appeal court. While the appeal court declined to test it, the Nencini court ordered this test in Fall 2013. It was found to bear Amanda Knox's profile. 2 Is the DNA on the Knife Meredith's DNA? 3 If the DNA Profile on the Knife Matches the Victim Then What Is the Issue? 3.2.2 What is Special About LCN DNA? The knife was the first Kercher-related item tested after a six-day interval since the last Kercher item. During this testing in 2007, seven swabs were taken from the knife, labeled A through G. Swab A and Swab B both caused a machine readout of "too low," meaning the amount being tested was low copy number, i.e. less than ten picograms in size. (Massei p. 250) These were amplified and Swab A yielded Knox's profile on the handle and Swab B yielded Meredith's profile in a groove on the edge of the blade. Lab contamination was ruled out by all courts on account of the above-mentioned weeklong interval since processing the last Kercher item. The reviewers initially complained in their report that the negative control tests (blank amplifications run to detect contaminants in the machine) had not been done in 2007, until it was established that documentation of these tests had been filed with the Massei court two years earlier. Swab B tested negative using a TMB test, which reacts to hemoglobin in blood. There are two possible reasons for this: First, like Knox's swab the Meredith material isn't derived from blood and instead is a piece of tissue which TMB wouldn't detect. The second is that, returning to the LCN nature of the material, the amount of blood is simply below the sensitivity threshold of the test. The defensive argument on this point is that since Swab B was negative for blood, the sample is definitely not blood and therefore it logically follows that Meredith was not injured with it, regardless of her DNA being detected on the knife blade. This argument is convenient but disingenuous as it requires the selectivity of accepting Knox profiles (also LCN and negative TMB) while seeking to exclude a Meredith result on the basis of these same characteristics. During the 2011 review two additional swabs were taken from either side of the blade where it meets the handle, marked H and I. The reviewers noted this to be human material but refused to extract a profile on account of it too being low copy number, estimated at just two picograms. Their refusal formed part of the grounds for vacating the acquittal verdict that would follow, and the new appeal court in 2013 ordered that this analysis be carried out. The result was Knox's profile. Is the DNA on the Knife Meredith's DNA? Yes. While the quantity of sample size was insufficient to repeat the analysis, the DNA profile is clearly defined and has very low background noise. It is a perfect match to Meredith's profile. The first profile is Meredith Kercher's profile. The second profile is the profile that was discovered on the blade of a knife recovered from the apartment of Raffaele Sollecito. The third profile is the previous two profiles superimposed. As you can see all the peaks match. 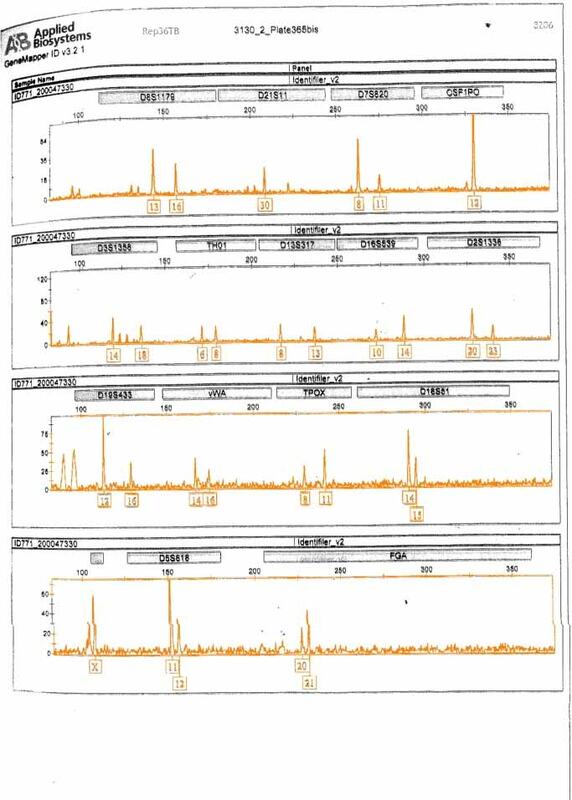 The DNA recovered from the knife is Meredith Kercher's profile. If the DNA Profile on the Knife Matches the Victim Then What Is the Issue? That the profile found on the knife recovered from Sollecito's apartment is a match to Meredith was never in question. The experts for both sides stipulated to the fact that those two profiles match. Conti and Vecchiotti, although they reveal their bias in attempting to avoid directly answering the question, eventually admit that the DNA profile recovered from the knife is a match to Meredith Kercher. Their criticism with respect to the knife DNA is that they feel Stefanoni ought not to have tested it at all, but since it was tested and a profile obtained this result should nevertheless be excluded because the small size of the sample precluded dividing it first for two separate amplifications. Specifically there is a minor objection that the lack of genetic material did not allow for repeated testing and a more significant objection that because the quantity of DNA was so small it might have arrived on the knife by some innocent means. One of the complaints regarding the DNA found on the knife is that because there was insufficient genetic material the DNA was only tested once. Under normal circumstances the genetic material would be divided so that multiple DNA tests would be possible. In this case Stefanoni determined that the best chance at getting a profile was to use all the genetic material in one test. Because there was insufficient DNA to test more than once, the various interested parties were given notice of when the test would be done so that they could be present to observe that the single test was performed properly. Amanda Knox's lawyers decided to not send anyone to observe the test but there were experts present representing the Kercher family and Raffaele Sollecito. Under Italian law the results of non-repetitive tests can be entered as evidence and a defense expert was present to observe the test and did not raise any objections to the procedures undertaken by Dr. Stefanoni. As such the inability to repeat the DNA test is not a valid issue. Conti and Vecchiotti contend that the quantity of Meredith's DNA is so small that it should be considered Low Copy Number (LCN). Stefanoni's testimony also accepts that the DNA on the knife was possibly a LCN sample. 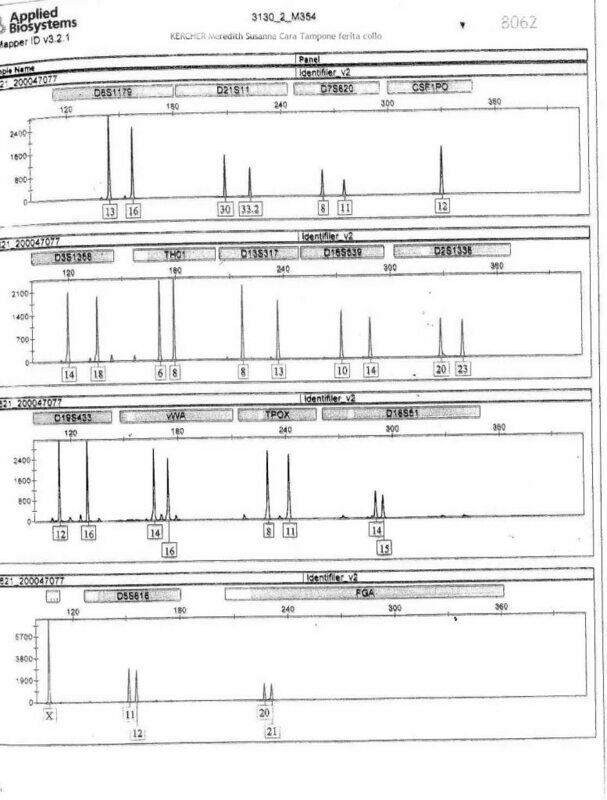 Looking at the graphical printout it seems probable that the sample was LCN specifically the peak imbalances strongly imply that the sample tested was an LCN sample. That the sample was an LCN sample is not an issue as while there are still some detractors in the scientific community the majority opinion is that LCN is reliable. In 2007 the Honorable Justice Robert Hanophy of the New York Supreme Court ruled that LCN DNA evidence against Hemant Megnath would be allowed. In the reasons for his decision Justice Hanophy made reference to LCN DNA being used worldwide for over ten years taking the time to specifically name Australia, Austria, England, New Zealand, Italy, the Netherlands, Spain, Portugal, and Switzerland as countries that have vetted and accepted LCN DNA as reliable. What is Special About LCN DNA? Maundy Gregory, an excellent blogger on the murder of Meredith Kercher, explains it better than we ever could. 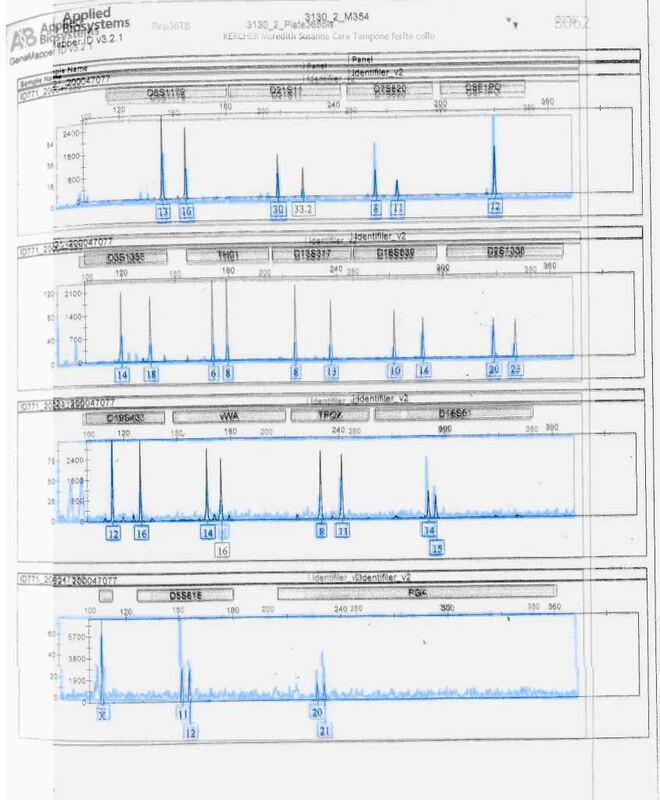 One difficulty with analyzing an LCN sample is that, because its presence in a solution is so faint, amplification is required during the PCR process (indeed, it seems clear that Stefanoni did carry out amplification on the sample). Think about this as being like turning up the volume on a cassette player to hear something that has been recorded at a very low volume. Inevitably you are also turning up the hiss. Background noise will normally be easy enough to distinguish from the genuine data, but the real problem is that, as you amplify, you may be amplifying faint traces of contamination that are also present. So, in our case, if there is a reasonable risk that Meredith Kercher’s DNA might have been present as a trace-level contaminant, then the test conducted ought not to be considered reliable. The concern with LCN DNA is that because the quantity of DNA is so small the risk is greater that a result is actually due to secondary contamination rather than a profile. This doesn't mean that LCN DNA is unreliable but that we have to factor this risk into our interpretation of findings and that forensic investigators need to take precautions to reduce these risks of contamination as much as possible. There are three routes by which Meredith's DNA could have ended up on Sollecito's knife other than the obvious explanation that it was used in the murder. They would be contamination during collection, contamination at the laboratory, and secondary transfer by a third party. The third option is not actually a form of contamination but since it is an innocent mechanism by which Meredith's DNA might have ended up on the knife we will treat it under the same category. Of the three options the only one that is a concern in our case is contamination at the laboratory and that risk was ruled out by the independent review of the DNA evidence. Meredith had never been to Raffaele's apartment and the forensic team that searched Raffaele's apartment had no personnel in common with the forensic team that searched the cottage. Dr Marco Chiacchiera was the only person who attended both the cottage and Raffaele's apartment but he did not handle the knife. Further there was a four-day gap between the search of the cottage and the search of Raffaele's apartment making it extremely unlikely that any kind of secondary transfer would be possible. There was no means by which any of the technicians who did the collection could have come in contact with Meredith's way and without a source of Meredith's DNA there is no possibility of contamination. Of the three options for an innocent explanations contamination at the laboratory is the one that on the surface would appear to be the greatest concern. Laboratories follow strict procedures and do negative tests to insure against contamination but the sample on the knife was an LCN sample and we know that at least twenty items with Meredith's DNA had been tested in the laboratory before the knife. The argument that the reason Meredith's DNA ended up on the knife was because of laboratory contamination while improbable it might be a possible criticism from scientists such as Conti and Vecchiotti who are highly suspicious of LCN DNA. Where the argument for laboratory contamination hits a dead end is with the testing schedule. No material related to Meredith's murder was tested in Stefanoni's laboratory for the six days prior to the knife. It is one thing to argue that the testing of the bra clasp just prior to the testing of the knife led to contamination but with a six day gap contamination is not possible. It is inconceivable that Meredith's DNA would survive multiple days of cleaning protocols. Further if a source of Meredith's DNA was present and acting as a contaminate then Meredith's profile should have appeared in the testing of materials completely unrelated to her murder. This would have been an immediate sign that something was wrong and the lab would have been able to address the issue. Conti and Vecchiotti were appointed by Judge Hellmann to be impartial independent reviewers of the DNA evidence but quite quickly it became apparent that they were biased against the prosecution and there was even allegations and evidence indicating they were working with the defense but even Carla Vecchiotti confirmed that contamination at the laboratory was not possible if there was a six day gap in the testing of materials related to this case.. It seemed painful to Vecchiotti but she said ruled out contamination and as such if an expert as hostile to the prosecution as Carla Vecchiotti ruled it out so can we -- Contamination at the laboratory is excluded as a possibility. Secondary transfer is the process when someone transfers someone else's DNA. An argument for secondary transfer is close to impossible. Despite what television shows about forensics would have us believe DNA is not everywhere nor does it transfer easily. A study of DNA transfer during simulated manual strangulation resulted in less than 66% of participants transferring their DNA to the victim. The amount of force and contact required to strangle someone greatly exceeds any conceivable contact Knox would have with the sharp-end of a knife but the study is referenced solely to show the degree of contact required for DNA transfer to occur. In a more relevant study Phipps and Petricevic discovered that when a subject handled a sterile tube 51-70% failed to transfer their DNA to the tube. Given what science tells us what people interested in considering this case need to do is forget everything that television has said about DNA. Television has misled you. Dry touch transfer of DNA is actually very hard. The studies above though are discussing primary transfer. For Meredith's DNA to end up on the knife through innocent transfer what would need to happen is that Meredith would first transfer her DNA to Knox and then Knox would transfer the DNA to the knife. This is commonly called secondary transfer. Another study by Phipps and Petricevic found that little or no secondary transfer happens. This makes intuitive sense given how difficult primary transfer is. If secondary transfer is unlikely under experimental conditions it would be even less likely under real conditions due to the added risk of the other person's DNA being destroyed in all the other interactions one typically has. The location of the DNA makes this unlikely event even less likely. The amount of pressure and friction are major considerations in dry transfer. Since Meredith's DNA was on the blade of a knife it is difficult to imagine a scenario where Knox would have been applying the necessary force and friction for transfer to occur. The location where Meredith's DNA was not discovered even without scientific considerations is extremely unlikely. Meredith's DNA was not found anywhere else in Raffaele's apartment. What is the probability that the only instance of secondary transfer would involve the blade of a knife that is compatible with the knife used to murder the person whose DNA is found? Lastly there is the issue that the DNA profile found on the knife blade is not a mixed sample. A review of the literature of secondary transfer has failed to find a single reported case of secondary transfer occurring without simultaneous primary transfer occurring. That is to say that if Amanda was the vehicle by which Meredith's DNA was transferred to the knife then Amanda's DNA should also be present and we know that it isn't. When given the choice of accepting the possibility of this being the first observed instance of something that has never been observed before during controlled experiments or accepting that the DNA was on the knife because it was used in the murder the correct answer is obvious. "The fact there is Meredith's DNA on the kitchen knife is because once when we were all cooking together I accidentally pricked her hand. I apologised immediately and she said it was not a problem." Twice Sollecito repeated the story of how Meredith had come over for dinner and that while he was preparing fish for the three of them he was playing around and pricked Meredith with that very knife. His story goes on to claim that Meredith did not find it funny and was displeased so he apologized and she forgave him. The problem with Raffaele's story is that it would turn out to be a complete fabrication. Not only had it never happened but Meredith had never even been to Raffaele's apartment. Raffaele just made it up. It was a lie to explain away damning evidence of the couple's involvement in the murder. Given there is no doubt that the profile discovered on the knife is Meredith Kercher's profile and that both contamination and secondary transfer have been excluded the only possible conclusion is that the DNA got on the knife because it was used in the murder of Meredith. That Sollecito would so quickly fabricate a lie to explain why Meredith's DNA would have been expected on the knife rather than protest that it is impossible just adds support to a position that needs no support. Sollecito's knife was used to kill Meredith. ↑ High resolution picture of the blade of "double DNA knife" taken in March 2011, in Conti and Vecchiotti's lab. Posted by Ergon at Perugiamurderfile.net, May 2013. ↑ Rutty GN. An investigation into the transference and survivability of human DNA following simulated manual strangulation with consideration of the problem of third party contamination. Int. J. Legal Med. (2002) 116: 170-173. ↑ Phipps M and Petricevic S. The tendency of individuals to transfer DNA to handled items. Forensic Sci. Int. 168 (2007) 162-168. ↑ Pisa, Nick. Meredith murder suspect tells 'secret prison diary' her DNA was on his knife because he 'pricked her ' while cooking. Daily Mail Dec 9 2007 Or see Raffaele Sollecito's Prison Diary (Translated) where he makes the claim. This page was last modified on 31 October 2014, at 11:56.